This pattern comes from the book A Life Of Faith number 270 from The Stoney Creek Collection, Inc. 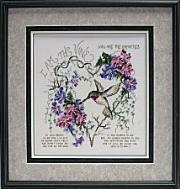 The pattern displays a hummingbird flying amongst some flowers surrounded by a vine heart with a verse from John. With Supplies: $48.12 You download the design. We will send you, 52 skeins of DMC Floss & Wichlet 28ct. 18x27" Jobelan (Antique White) to complete your project.